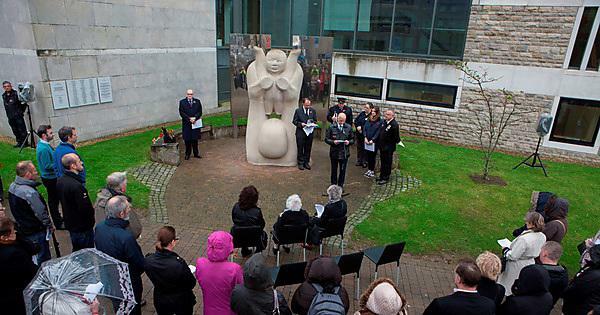 The victims of the bombing which caused the greatest loss of civilian life during the Plymouth Blitz will be remembered on its 75th anniversary at Plymouth University. Staff, students and members of the public will gather at the main campus Portland Square memorial on 22 April at 12pm to remember the Portland Square air raid shelter bombing. Only a few metres away from where its memorial now stands, the shelter suffered a direct hit at around midnight on 22 April 1941. Seventy-six people were killed, and in some cases, entire families were wiped out. Survivors including Barbara Mills, 86, who lost her mother, father, sister and grandfather in the blast, plan to attend the service and lay tributes. Oliver Colville MP, Lord Mayor Councillor Jon Mahoney, members of the local clergy and armed forces cadets will also be attending. There will be a number of floral and verbal tributes too, including from Plymouth University Deputy Vice-Chancellor, Professor Simon Payne, and Executive Officers from Plymouth University’s Students’ Union.